UPTOWN — Students at Walt Disney Magnet School will soon be scribbling notes onto glass walls. The Uptown school at 4140 N. Marine Drive is getting a new hi-tech computer lab dedicated to the late Diane Disney Miller, the daughter of Walt Disney who has contributed at least $700,000 to programs at the school and died in 2013. "We realized that the computer lab we designed 10 years ago is no longer en vogue," said school Principal Kathleen Hagstrom, who's been on the job for the last 14 years. "It used to be that students learned more independently, but now everything is about collaboration because often that's how people work in their careers." 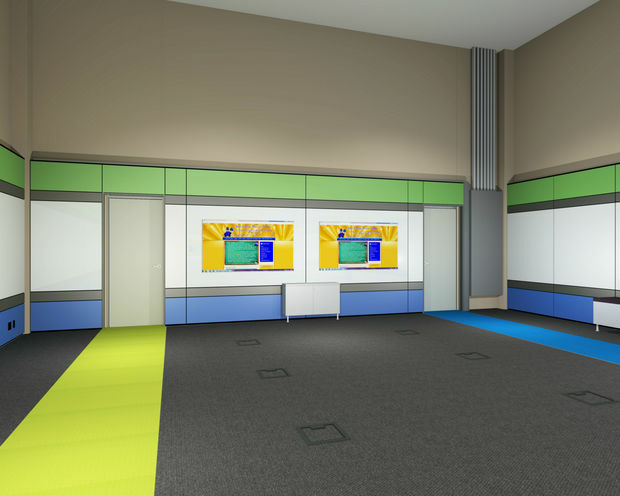 The redesign will include glass walls that students can write on, Promethean interactive white boards up to 85 inches wide that teachers can use for instruction, various modern and collaborative seating arrangements, large projection screens and hi-tech equipment like touch screens and tablets. The signs for the lab were unveiled Friday, but the actual lab won't be completed for another couple of months, Hagstrom said. Since January, the school has been working toward opening the lab, which is slated to cost roughly $250,000, Hagstrom said. While the principal would not say exactly how it was funded, she said the money to build a new lab came from a "myriad of sources," including the school budget and state funding. "We are also very good at generating resources," she added. Walt Disney Magnet School opened in the 1970s as the first magnet school in the city. A magnet school offers special programming or instruction not offered elsewhere. In the case of Walt Disney, that special programming is integrating arts and technology. The school has an enrollment of approximately 1,600 students from pre-kindergarten to eighth grade. Hagstrom said students from fifth to eighth grades will primarily be the ones using the new lab. There they will be learning how to code using the program Scratch. They'll also be learning how to animate using Flash, among other kinds of software, Hagstrom said. Hagstrom said the students "love" the idea of the "21st century technology lab." "It'll blow them away," she said.